In the main building there are ten hotel rooms, one of these is a premium room and another a luxury suite. 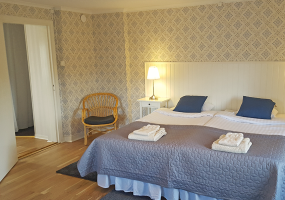 all rooms have benn renovated since Carina and Bengt acquired the hotel in 2016. This means e.g that all batrooms are completely renovated and the rooms are redocorated with nes wooden floors. In the annex there is a studio for two people with a couch for yet another person. There are also two apartments for four people each with a separate entrances, two bedrooms and a combined living room/kitchenette as well as shower and toliet. Furthermore, on the second floor there are two double rooms with shared bathroom, perfect for the larger family or a bunch of buddies. Whether you come as a businessman or on your own, in a big perty or as a newly wed couple we have suitable accomodation. 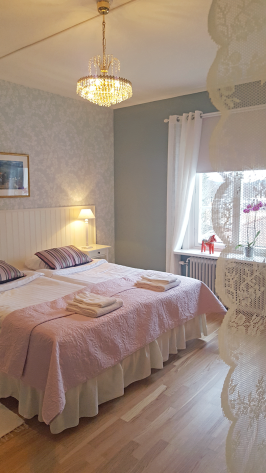 In the charming single rooms you relax on your own and enjoy the peace and quiet. 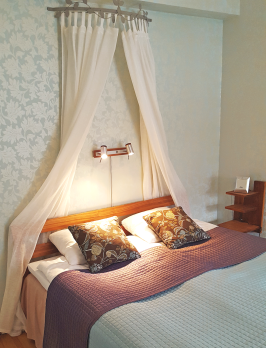 For couples that want a double bed we have suitable rooms including a premium room. In our luxury twin room suite you can celebrate an indulge in luxury. All rooms have shower, toilet and TV. 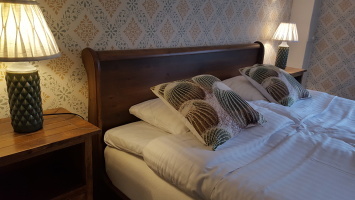 On the common room which is located adjacent to the individual rooms you can spend the evening relaxing with a cup of tea or coffee, gather with your fellow travellerrs, check the newspaper and magazines or read a book from the small library. 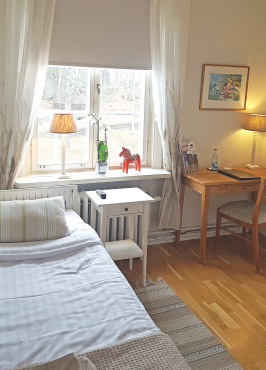 S uite with two rooms, double bed, jacuzzi and a private balcony overlokking the park. 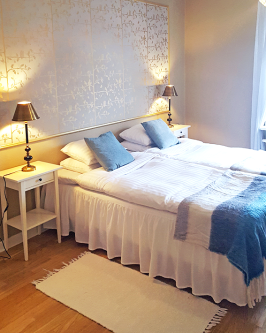 Spacious double rooms with a double bed and comfortable seating in the main building. Our apartments in the annex each have three rooms, two separate bedrooms and combined living room/kitchenette, accomodating 4 people. Newly renovated premium room with a double bed and a large bathroom with a shower and a bathtub. The Studio in the annex accomodate 2 persons and an extra bed in a coach. One room with kichenette. On the second floorr in the annex there is two doule rooms with shared bathroom and toliet. Lovely located in a traditional environment with a beautiful large park outside the hotel. Spacious rooms. Friendly staff. The feeling of an old mansion is still there. Close to lake for swimming if the weather is nice. Received an upgraded room. Was unfortunatley ill during the stay, bu wonderful and caring service from owner. Incredibly good food and drink.